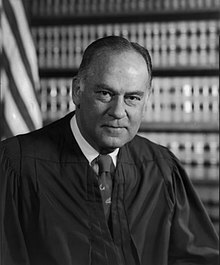 Potter Stewart (January 23, 1915 – December 7, 1985) was an American judge. He was the Associate Justice of the Supreme Court of the United States from 1958 through 1981. During his tenure, he made, among other areas, major contributions to criminal justice reform, civil rights, access to the courts, and views of the Fourth Amendment. Stewart died of a stroke at his Hanover, New Hampshire home on December 7, 1985, aged 70. ↑ Friedman, Leon. The Justices of the United States Supreme Court: Their Lives and Major Opinions, Volume V. Chelsea House Publishers. 1978. page 291–292. This page was last changed on 12 April 2017, at 08:48.